This meadow-dwelling annual, which reaches a height of 10 to 30 cm, is easily overlooked amidst the sea of summer flowers. 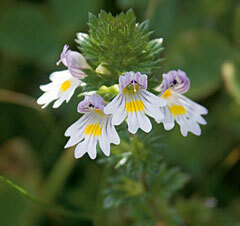 At first sight the white to pale violet flowers, which are no more than 1 cm long, resemble field pansies. With their violet-veined throat and three-lobed lower lip they might also be taken for small orchids. A prominent sign is the bright yellow spot on the lower lip, the shining eye of the flowers which adorn the many branched stems from late summer to autumn. Invisible to the observer are the root suckers with which eyebright draws nourishment from the roots of neighboring grasses, this semi-parasitic behavior giving it an advantage over the other plants in the crowded meadow. Found in Dr.Hauschka Mascara, Eye Solace and Liquid Eyeliner!